Dr. Philip Chaney is an associate professor of Geography at Auburn University. For 21 years he has taught students about natural disasters and directly worked on research projects for Lee County Emergency Management Agency. Dr. Chaney worked with victims of previous tornadoes to understand their preparedness and how they responded during the storm. Recently, he researched potential sites for community tornado shelters including in the Smiths Station area where a tornado just devastated the local community. He was interviewed on March 4, 2019, by Russell Lewis, the Southern Bureau Chief for National Public Radio (NPR), for a story appearing in Morning Edition on March 5. Dr. Chaney spoke about the importance of being aware of tornado warnings and understanding the time needed to respond. 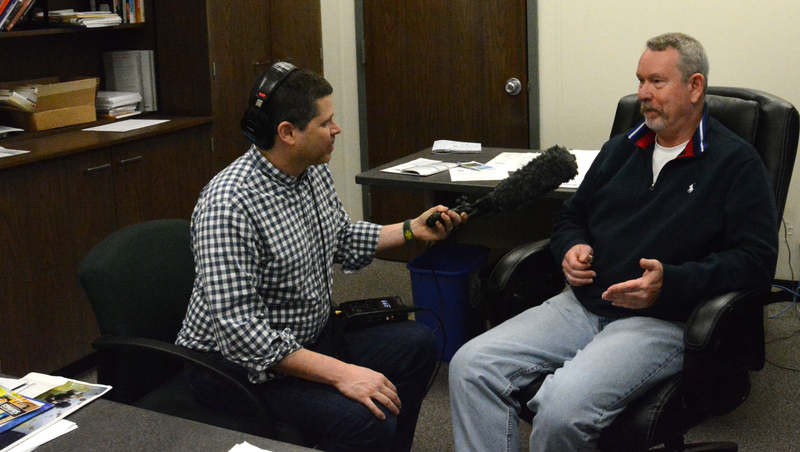 NPR's Russell Lewis interviewing Dr. Philip Chaney from the Department of Geosciences.